What is a UTQG treadwear rating? 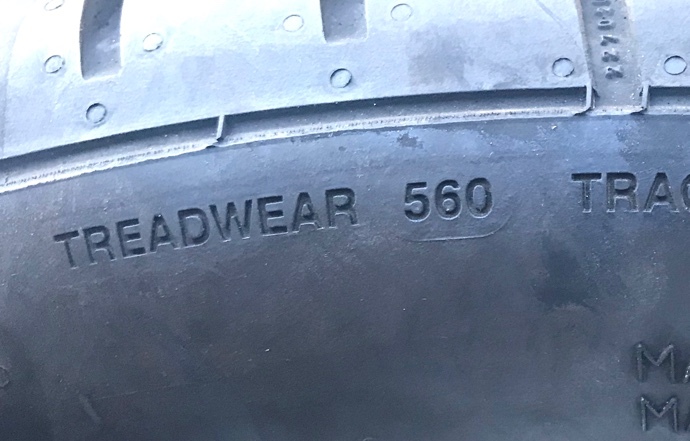 The UTQG (Uniform Tire Quality Grade) treadwear rating, also known as a treadwear grade, is a number stamped on the tire sidewall that relates to expected tire life. In basic terms, and in the spirit of the concept, the higher the UTQG treadwear rating, the greater the tire life. A tire with a "600" treadwear rating is forecasted to last twice as long as a tire with a "300" rating, and should accumulate three times the mileage of a "200" rated tire. To understand how treadwear ratings vary and for basic real world reference points, consider that standard touring all-season tires engineered for high mileage can have treadwear ratings in the "700-800" range. In contrast, motorsport tires for racing, which are focused on maximum grip (tire life is a distant secondary concern) might have a treadwear rating in the "100" range, or even less. How can you use UTQG treadwear ratings when researching and buying tires? First you have to understand the limitations of the treadwear ratings information. While the UTQG treadwear rating is mandated by the National Highway Traffic Safety Administration*, and the testing process is supposed to be the same for all manufacturers, the NHTSA does not test tires and assign the ratings. Rather, it's the tire manufacturers' duty to conduct (or commission) the testing. This means that UTQG treadwear ratings are not established by an objective testing organization, or according to a universal ratings scale. A "400" treadwear rating from Tire Manufacturer A doesn't necessarily equal a "400" treadwear rating from Tire Manufacturer B; the mileage lifespan of the two tires under equal driving conditions could be quite different. If you're trying to choose between tires of the same type from the same manufacturer, the treadwear rating could be a deciding factor. Treadwear ratings are therefore most informative and helpful when comparing tires from the same manufacturer. If you're trying to choose between tires of the same type from the same manufacturer, the treadwear rating could be a deciding factor. Tire manufacturers could be accused of inflating their treadwear ratings to appear superior to the competition, or even being conservative on the ratings in certain circumstances. However, within their own product range, the ratings should correspond to actual testing results. When comparing treadwear grades of tires from two or more manufacturers, treadwear ratings are less instructive. However, we wouldn’t say that it’s pointless to consider the ratings from different manufacturers. There is often a correlation between treadwear rating and actual tire life. Across the range of tire categories, it's common for tires with high UTQG ratings to be favorably reviewed by users when it comes to treadlife. A tire with a "600" treadwear rating might not last exactly 3 times as long as a tire with a "200" treadwear rating, but it's a safe assumption that the "600" rated tire will be longer-lasting. If you're shopping for a high-mileage set of tires, a low treadwear rating is a red flag and an indication that the tire might fall short of your mileage expectations. The treadwear rating can therefore be used as one data point to help guide your tire purchase decision. If you're shopping for a high-mileage set of tires, a low treadwear rating is a red flag and an indication that the tire might fall short of your mileage expectations. Especially when considered in combination with the tire treadlife warranty, the UTQG treadwear rating provides a preview of expected tire life. It's definitely not a perfect ratings scale or system, but if long tire life is a priority for you, consider the treadwear rating and the treadlife warranty. Also be sure to check out the TireBuyer.com user reviews for mileage feedback – you’ll find them on the "Reviews" tab on every TireBuyer.com product page. Also check out our tire rotation and alignment articles for tips on how to achieve the maximum treadlife from your tires. *A UTQG rating is not required for certain types of tires, e.g. winter tires, mud-terrain tires with deep tread, and temporary spare tires.